On 31 December 2018, NASA’s Origins, Spectral Interpretation, Resource Identification, and Security-Regolith Explorer (OSIRIS-REx) spacecraft began to orbit the asteroid (101955) Bennu, a near-Earth asteroid believed to harbour organic molecules and hydrated minerals. Such an asteroid may have once introduced carbon-rich material to Earth. To study the asteroid’s pristine surface, the OSIRIS-REx team will collect a sample for laboratory analysis back on Earth. 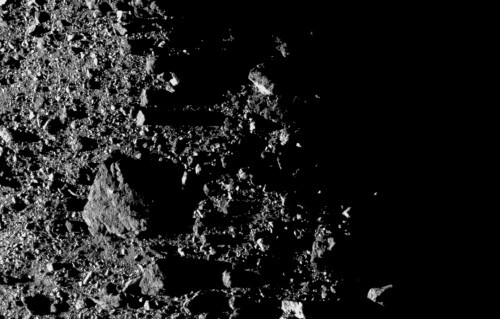 But before that happens, two years of detailed observations will enable the team to study Bennu up close and select a safe landing site. Our online Collection showcases the first results from OSIRIS-REx on its approach to (and preliminary survey of) Bennu in the latter half of 2018. Observations of asteroid (101955) Bennu with NASA’s OSIRIS-REx spacecraft reveal an unexpected surficial diversity that poses a challenge to the success of the sample-return mission. , H. C. Connolly Jr.
Near-Earth asteroid Bennu has a top-like shape with longitudinal ridges, macroporosity, prominent boulders and surface mass wasting, suggesting that it is a stiff rubble pile, according to early observations by the OSIRIS-REx mission. Bennu’s surface presents evidence of a variety of particle sizes, from fine regolith to metre-sized boulders. Its moderate thermal inertia suggests that the boulders are very porous or blanketed by thin dust. Bennu’s boulders exhibit high albedo variations, indicating different origins and/or ages. Signatures of phyllosilicate-like hydrated minerals are widespread on Bennu’s surface, indicating significant aqueous alteration. The lack of spatial variations in the spectra down to the scale of ~100 m indicates both a relatively uniform particle size distribution and a lack of compositional segregation, possibly due to surficial redistribution processes. Vicinity of small bodies might be dangerous to the spacecrafts and to their instrumentation. Here the authors show the operational environment of asteroid Bennu, validate its photometric phase function and demonstrate the accelerating rotational rate due to YORP effect using the data acquired during the approach phase of OSIRIS-REx mission. Bennu’s surface has experienced continuous changes, mostly induced by its accelerating spin rate, which could have resulted in a collapse of its interior in the past. This scenario is also supported by the heterogeneity of Bennu’s internal mass distribution. NASA mission finds asteroid Bennu littered with big boulders and spraying out particles. NASA’s spacecraft OSIRIS-REx is planning to bring back a sample from a near-Earth asteroid in 2023, and it has just delivered its first scientific results. It is only one of the projects from various space agencies that will put small bodies and sample return into the spotlight in the upcoming decade. Near-Earth asteroid Bennu is one of a range of bodies in the Solar System to have been reached by space missions in the past months. Crowd-sourcing technologies can help with the exploration of its surface. Japanese and US missions returning samples from the carbon-rich asteroids Ryugu and Bennu are the latest steps in probing our Solar System’s smallest bodies, near and far, for clues to our own origins and directions for our future exploration. After the return of Hayabusa from asteroid Itokawa in 2010, the Japanese space agency JAXA developed a plan to investigate how our planet became habitable. The Hayabusa2 spacecraft mission to the asteroid Ryugu is just one part of this exploration that aims to track water and organics throughout our Solar System. On 27 June 2018 the Hayabusa2 spacecraft arrived at the carbonaceous asteroid Ryugu — a top-shaped asteroid with a very dark surface and many boulders. After a careful search for a safe and flat landing site, the first touchdown successfully took place on 22 February 2019.